Campaign for the American Reader: Pg. 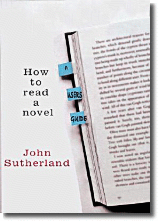 69: "How to Read a Novel"
I learned about Marshall McLuhan's "page 69 test" from an excerpt from John Sutherland's How to Read a Novel. So how does Sutherland's book do by this criterion? Clever Claire Harman checked it out for the Telegraph: "page 69 of his book (which is about D.H. Lawrence and censorship) is pretty good." In the Independent D.J. Taylor also gave Sutherland's book high marks, though there's no mention of how well the "page 69 test" would have worked.